↑ Maton, Anthea; Jean Hopkins; Charles William McLaughlin; Susan Johnson; Maryanna Quon Warner; David LaHart; Jill D. Wright (1993). Human Biology and Health. Englewood Cliffs, New Jersey, USA: Prentice Hall. ISBN 0-13-981176-1. OCLC 32308337. ↑ Kong F, Singh RP (June 2008). 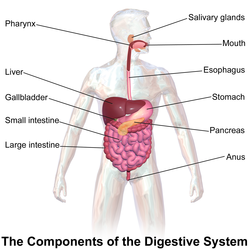 "Disintegration of solid foods in human stomach". J. Food Sci. 73 (5): R67–80. doi:10.1111/j.1750-3841.2008.00766.x. PMID 18577009. หน้านี้แก้ไขล่าสุดเมื่อวันที่ 22 มีนาคม 2562 เวลา 18:46 น.